Built for the Carron Company of Carron, near Falkirk and engaged in carrying their own products and raw materials, as well as on public carriage as a feeder vessel for the Company's Grangemouth to London steamship services. 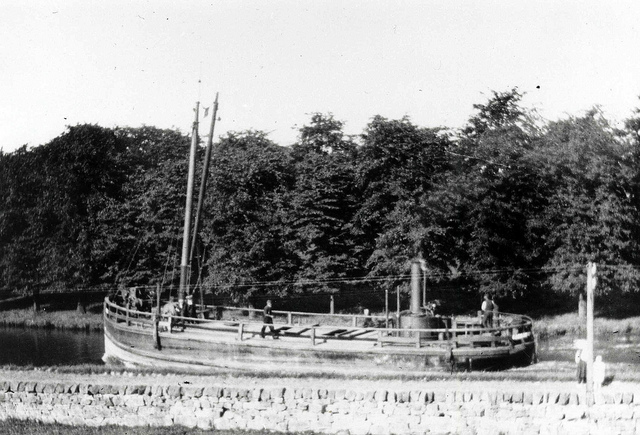 In 1922 she was laid up at the Burnhouse Basin at Carron before being sold in July 1925 to John Day of Hull. She went to the breakers yard in April 1940. The photograph below has no information with it but given its source my guess is that it was probably taken somewhere on the Forth and Clyde Canal prior to her move south in 1925. It is an excellent illustration of the earlier "inside" design of steam lighter with the top of the boiler protruding above the deck without any deckhousing, a hand tiller, and no bulwarks.